The Wanapum basalt unit includes the Wanapum Basalt of the Columbia River Basalt Group, thin sedimentary interbeds, and in places, overlying loess. The unit occurs as isolated remnants on Green Bluff, Orchard Bluff, Peone Prairie, and Fivemile Prairie. The Grande Ronde unit includes the Grande Ronde Basalt of the Columbia River Basalt Group and sedimentary interbeds, in places. This unit provides sufficient water to numerous domestic wells in the west-central part of the study area from Half Moon Prairie to several miles north of Deer Park. 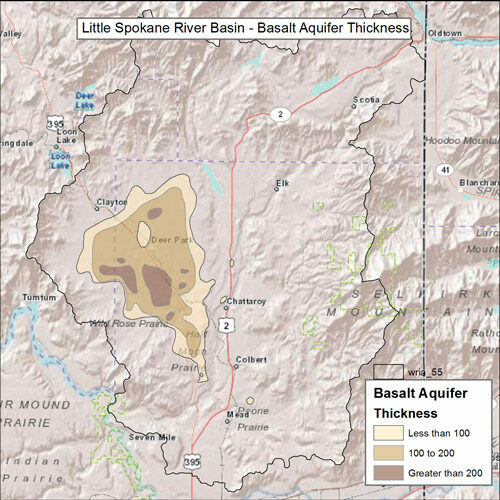 WRIA 55 Basalt Aquifer extent and thickness. Delineated in USGS Scientific Investigations Report 2013-5124.